After public concerns regarding the initial proposed location along El Camino Road, two solar arrays in the corporation yard and one in the Churchill parking lot have recently finished construction, which began in June, and are expected to become fully operational sometime between October and December. 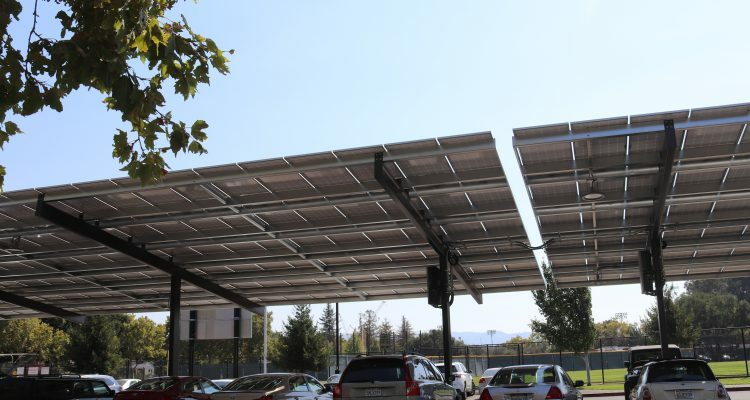 Following the original proposals in February to install elevated carport solar arrays, several residents criticized the placement due to its interference of the view of historic Paly buildings. Multiple committees including the Palo Alto Historical Association, Alumni Association Board and the Canopy objected against the compromisation of the archival nature of the area. Rachel Kellerman, Paly librarian and member of the Facilities Planning Committee, was an adamant supporter of the location change. “In my view, aesthetically, I felt like it didn’t go with the certain nature of the [tower] building and surrounding area, and so I objected,” Kellerman said. In response, Palo Alto’s Board of Education worked with Palo Alto Unified School District (PAUSD) staff to determine a less conspicuous area, reaching out to internal stakeholders, parent groups, site leadership and other groups recommended by the site administration. “I felt like [the issue] was competing goods and trying to find a compromise and once the board understood the points of view from the [public], they did listen and make those compromises,” Kellerman said. However, the location change brought an abundance of difficulties, according to board member Todd Collins. Economic issues imposed further restraints as the District sought to align costs of electricity and panel installation. Roof mounted panels were subsequently minimized due to their higher cost, resulting in the implementation of shade structures. The project is a power purchase agreement, meaning PAUSD worked with a third party that finances and owns the panels. The District is under contract to purchase the electricity generated for a predetermined rate that scales over time. These costs are currently expected to remain below market rate. Plans were eventually finalized, allowing construction to finish before the school year began, along with two other solar projects located at JLS and Fletcher middle schools and three projects at Nixon, Ohlone and Escondido elementary schools. However, according to ARC Alternatives president Russell Driver, the rooftop systems are still being reviewed by the Division of State Architect. “One just got approved, the other is still pending, so we will see construction starting with those remaining two systems in September or October,” Driver said. New structures that will be added to the school will likely contain more rooftop panels due to a California law implemented in May which will mandate solar panels on new constructions as of 2020. As Paly is the largest electricity consumer in PAUSD, the District hopes future bond planning might include further additional arrays. When completed, the district-wide systems are currently anticipated to save nearly $600,000 over the 25 year period of the project, after an initial cost of $100,000 in the first 14 years. “The great news is that we save money, not a lot of money, but enough that the project actually yields a positive result for the taxpayers,” Collins said. While residents will be pleased to hear that the project will be financially favorable, the largest benefit is the ability to produce clean, sustainable energy. According to PAUSD sustainability director Rebecca Navarro, the total system capacity is expected to offset the carbon emissions of 211 houses in Palo Alto annually, with Paly currently responsible for 42 houses’ worth of emissions as a 216 kilowatt system. The district is also working with City of Palo Alto Utilities and Renewable Energy Corporation Solar (REC Solar) to develop and offer solar power related curriculum to all PAUSD students. “We will have real time data available to every staff and student once the systems and fully interconnected, and we’re really excited to have this authentic resource for classroom learning,” Navarro said. The panels have also been generally well-received by the public. Walter Hayes, the chair of the Sustainable Schools Committee, expressed their gratitude to the district and their efforts.